American DJ Jelly Globe DJParts - All Variety of Parts that DJ Needs. The Jelly Globe is part of the popular transparent case effects known as the ADJ Jelly Series. 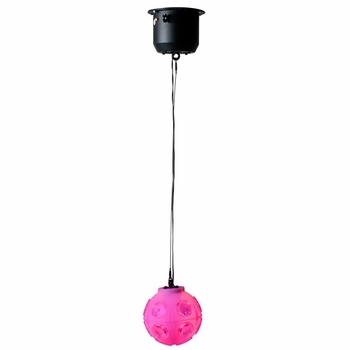 It features two effects in one: a rotating ball that produce 15 sound activated, multi-colored, sharp beams of light, and a transparent ball that glows creating an exciting effect on its own. This effect is powered by 2x 3-Watt, (3-IN-1) RGB TRI Color LEDs. The ADJ Jelly Globe offers a new twist on an old school lighting effect and brings pure lighting excitement to any party. Specifications: • Slow rotating ball that produces 2-FX-IN-1: glowing transparent case + sharp RGB beams of light • Easy-to-use , the Jelly Globe produces 15 sound activated beams that change color and strobe to the sound of music • 2 x 3-watt (3-IN-1) RGB “TRI Color” LEDs produce a variety of color effects • No Duty Cycles! – Runs extremely cool! – Run all night! Designed for continuous long-lasting operation • Built-In light shows • Led Strobe effect • Wide beam spread covers a large area • Beam angle: 330 degrees • Rotation: Variable up to 5 RPM • Safety Loop on rear panel • Long life LEDs (Rated at approximately 50,000 hrs.) • Light Source: 2 x 3W TRI RGB’s LEDs • Power Draw: 11.1W total (All LED's @ Full On) • Power Voltage: AC 120V/60Hz or 230V/50Hz • Dimensions (LxWxH): Total: 5.5” x 5” x 28.5” / 140 x 130 x 723mm; Ball: 5” / 130mm; Cable Length: 19” / 500mm • Weight: 3 lbs. / 1.1 kg.